I arrived into Uyuni which sits on the edge of the Bolivian salt flats in mid afternoon. Excitedly I went out on foot towards the edge of the flats in search of the mysterious train graveyard a few hours before sunset. I followed the tracks until about an hour later I found myself among the rusted skeletons of hundreds of locomotives and train cars slowly rusting away. The sunset was spectacular and the sky exploded with the most intense colors I've ever seen, intensifying as the sun sank lower and lower behind the horizon, which I later found out is due to the extreme altitude. 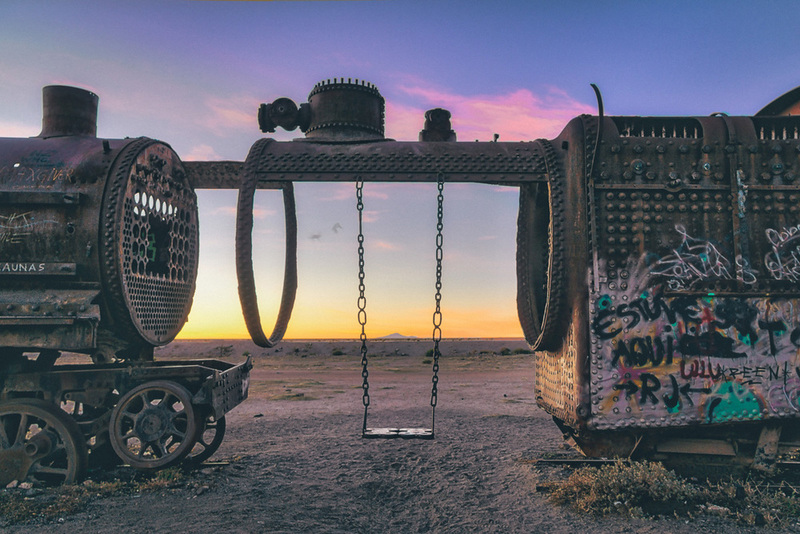 I stayed for a few hours to watch the sunset, climb around the rusting carcasses and taking as many photos as I could before walking back to town in the dark. Walking back alone in the dark turned out to be a poor decision, as the only thing between me and packs of wild hungry dogs scavenging in the dark was a large stick I found along the tracks. I counted 5 when they reared their heads from the pile of garbage they were poking though to watch me walk by. After I passed they all trotted along behind me for several hundred meters. I had to keep my eye on them the whole way back because whenever wasn’t watching one of them would run up behind me getting a little too close for comfort. Thankfully they peeled off when we came across a large pile of dirt which seemed to interest them. If I go back, I will be taking a taxi instead.